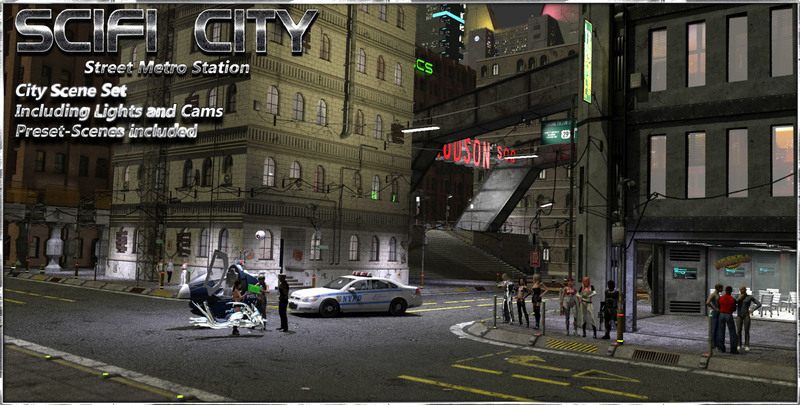 Welcome to our newest addition of the SciFi City Streets Set. settings including. Preset Cams to render from multiple angles. Easy to adopt. Check out the sample renders to get an idea of what you can do with this huge set. Works nicely with our other SciFi City sets. rem. : Build for Poser, loads OK in D/S with a few limitations (see readme). Check out our large freebie area and our other sets in the store. Here comes our first explicit foreground set for our SciFi City Product line. 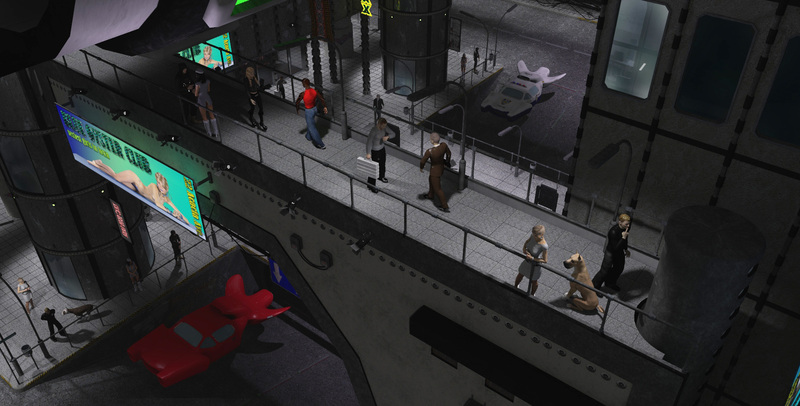 your people on viewing out your scifi cities. or walls to make long focal lense shots. The building roof contains an inner staircase. You can walk up and go out! – Complete Foreground set, boned item. Includes Masterdials to open doors, Powerboxes can open. 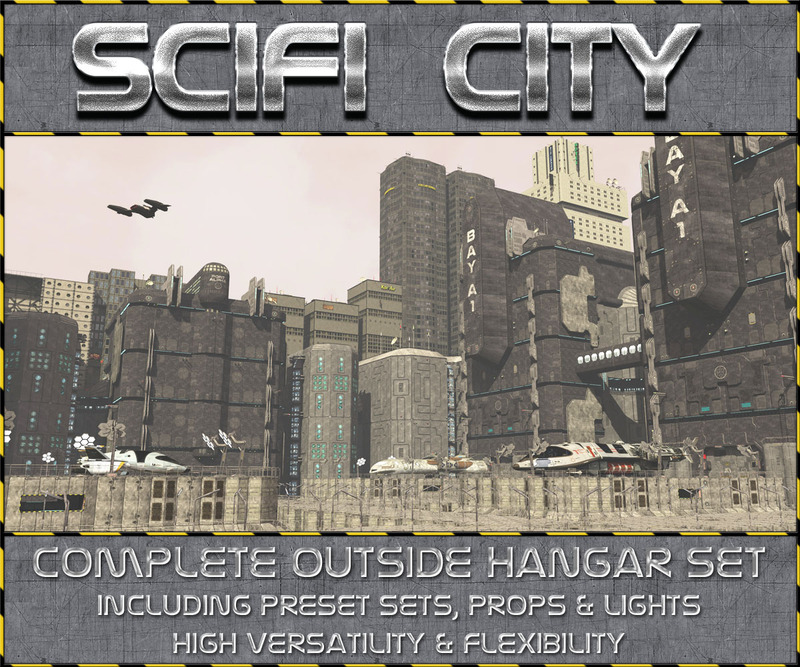 Also check out our other SciFi City kits and our big freebie area! Here comes our SciFi City Construction Set 3. 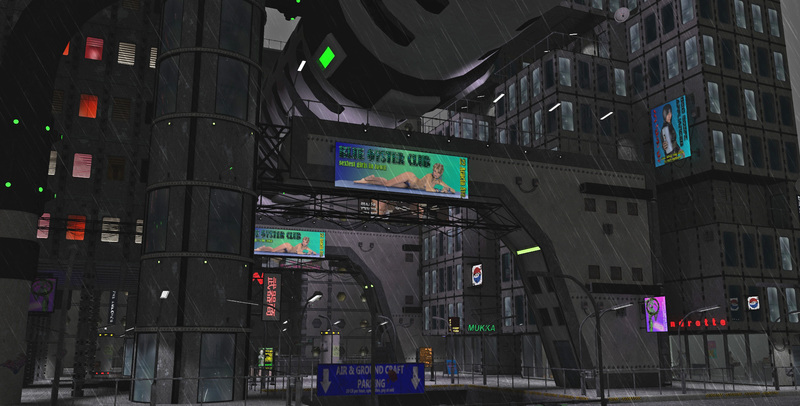 This set is a complete stand-alone SciFi City Construction Package. You receive streetplanes, buildings and accessoire, all build to work as simple as possible. having dozens of lights build. practise and manage your city build in Poser. – Street plane with the middle items removed so you can land a ship or start a market or …. Works nively together with our other SciFi City construction Sets! Check out our store and big freebie area for more! Rem: Pack is build for Poser but works out OK in D/S with a few limitations (see readme). Herewith you receive the full SciFi City Construction Set to build a whole City based on your own ideas. No ironed streetset, this is fully to your own ideas. We have prebuild three scenes for you to work with. The set will deliver you 10 buildings and a complex streetplane with smaller buildings to assemble. All get additional signs to attach to them. Also you get street lanes and add on stuff like skycars, light beams and of course light sets and a hemisphere with additional daylight materials. detail building. Check out the samples. The Template for the SkyDome will be avaliable shortly as a freebie. DS Users: This set is build for Poser. It will load in D/S with a few tweaks neccessary. Limitations with D/S are outlined in the readme. Thanks for using our sets and have fun playing! this set will give you an entire set of a modular hangar bay for a scifi city or larger outpost. arrays of platforms and lights to start an easy custom setup. Set has been designed to deliver you far scape options for large constructions under the constrain of limiting polygon use and focus on texture quality. So you can as well do close up renders (see samples). Buildings have morph inject to open/close doors. Rem: This set is designed for POSER. It loads OK in D/S but some material shaders appear different. Check readme for details. 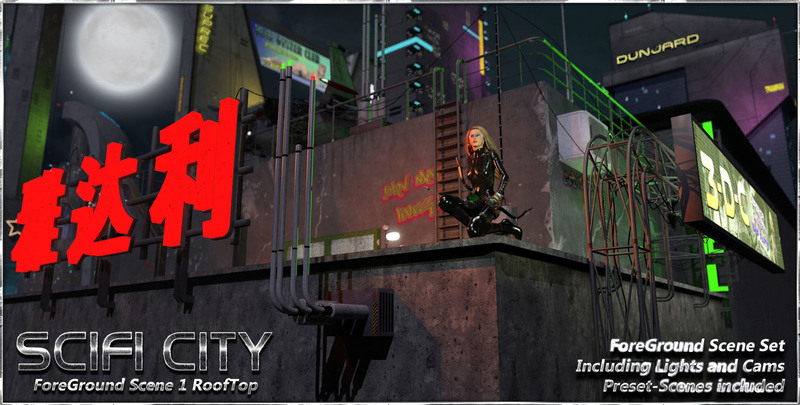 Thanks for using our sets and check out the other parts of the SciFi City sets! 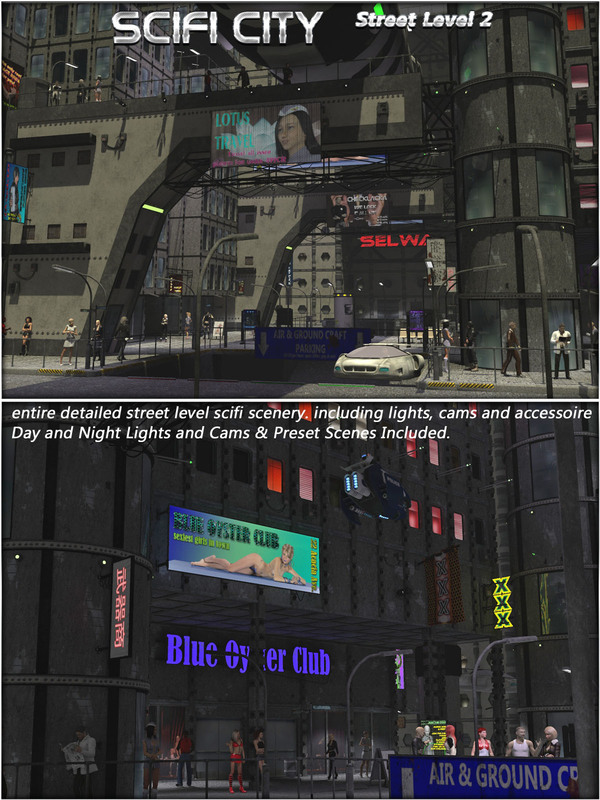 Welcome to our newest SCIFI City Scene: The Redlight and Shopping District. This set will bring you a full City Ground Area with loads of options and versatility. A full preset scene is included. to your scene. Items are mostly modelled out and so they can be used in close up renders. Buildings are build in a way you can rotate them in 180 degrees to allow even bigger scenes. 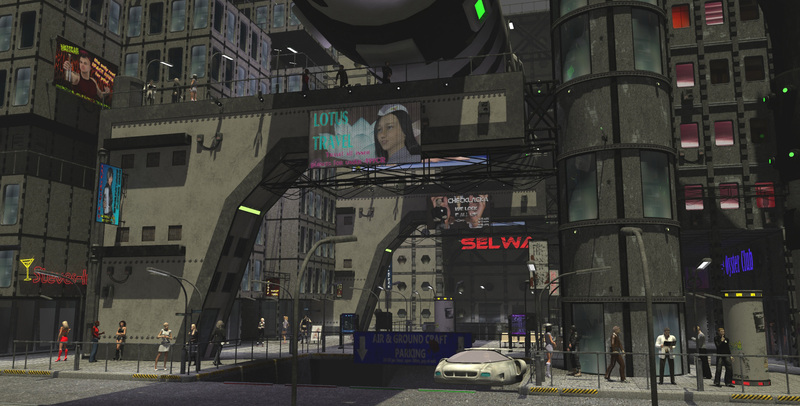 Unveal your SciFi City ideas now! Check the gallery tab below to check out larger renders in full size mode! 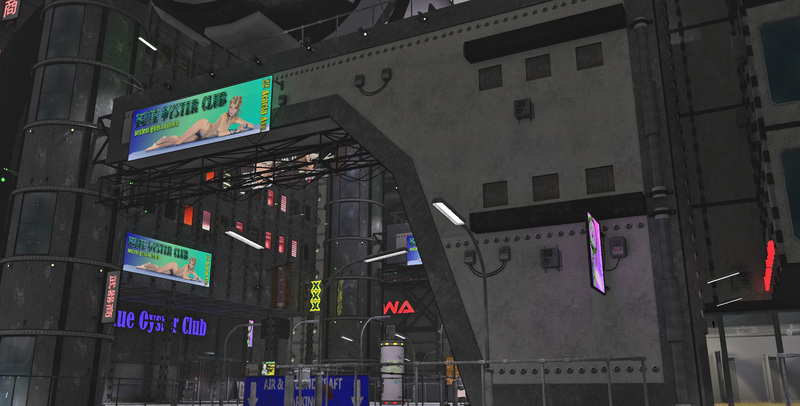 Check out our large freebie area and other sets of the SCIFI City line. Remark: This is a high poly set. All details of the buildings are modelled out to detail to allow close up shots. We recommend to render scenes of this kind in parts to avoid memory overflow. All samples rendered in this product package where rendered in one piece. D/S Users: Package is build for poser but loads OK in D/S. Some material shaders may look different in D/S. 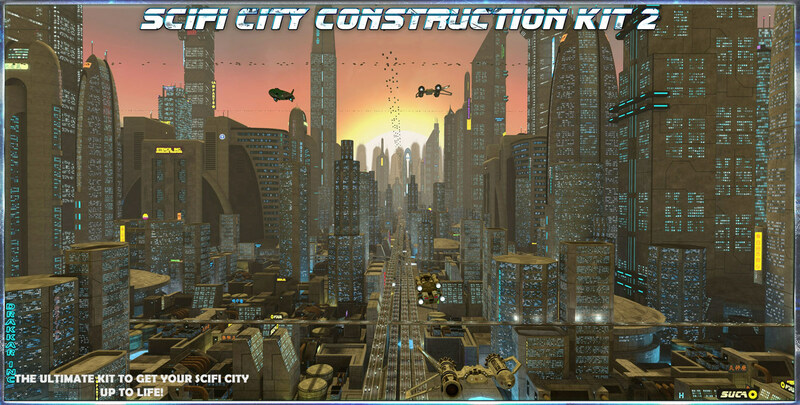 The SCIFI City Construction Sets! The third set of this series will bring you up into the sky! levels of this building) with a parking space, landing bay and a sky cafe. Likewise what you would usualy expect up in the sky of our future cities, right? etc. Very easy and versatile to use. 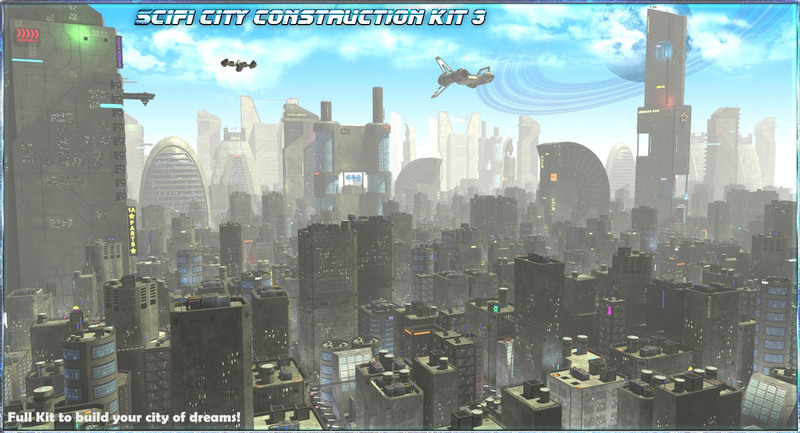 you will see the City Construction Base Pack 1 to model the backgrounds. Remark: Ships, People, Clothing and boxes are not included in this set! There is far more to come on this product line. Stay tuned!! THis set is build for Poser 7 up. Best results in Poser 8 up. Limitations for D/S Users: The Set loads OK in D/S. Check our large freebie section here or under our website. The second set of our series will give you a very detailed street scene. This set is build precisly to allow you make any close up scene you’d whish. Check the sample renders to get an idea of the possibilities. We have also included a five page tutorial to explain the usage. The SCIFI City Construction Set! modular set to build Cities of SciFi Style. Even though, not just that. able to make close up shots. the sample renders to get an idea how versatile this set is.